I argued in my last post on Play the Past that the simulation game Prison Tycoon can only imagine an inwardly-directed, self-contained prison world—a world we know to be at odds with prisons in the real world. In the comments to that post, Peter Christiansen suggested comparing Prison Tycoon with Tropico, another PC game in which prisons figure prominently. Indeed, I had always planned to conclude my series of posts on virtual prisons with Tropico, a tongue-in-cheek simulation in which the player assumes the role of El Presidente of a small Caribbean Island. While we could—and at some point, should—look at Tropico as a satirical expression of the United States’ checkered history with the Caribbean, particularly Cuba and the Dominican Republic, I want to focus here on Tropico as an oddly ahistorical simulation of the kind I explored in my other posts on Play the Past. 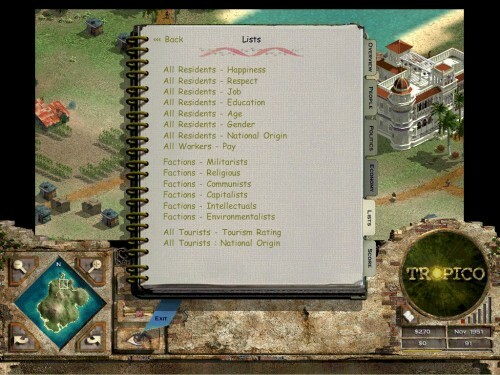 Like those other simulations, there is a bewildering array of variables to manage in Tropico: the island’s housing, its mines and industry, farms, tourism, the infrastructure, media, human services, and of course, public safety and the security of the president’s own occasionally unpopular and undemocratic regime. And finally, the reason I’ve brought this game into the discussion, we can arrest those leaders with a few mouse clicks. In one of my recent playings of the game I (as the island’s dictator) arrested one Consuela Diaz, the 72-year-old opposition leader of a religious faction on the island. But faction leaders are not the only people you can arrest. Once a prison is built and you have enough money in the treasury to pay your guards, it is possible, in what the game calls the “Edict Mode,” to arrest anybody, at anytime. The edict mode shifts gameplay into a state of emergency, what the Italian philosopher Giorgio Agamben calls the “state of exception.” Put simply, the state of exception is the power to suspend the rule of law in the name of preserving the rule of law. If we follow Agamben’s argument that “the [concentration] camp is the space that is opened when the state of exception begins to become the rule” (168), we begin to understand the entire gamespace of Tropico as a virtual camp. That is, it is possible for the entire island in Tropico to become a semi-permanent nether-region, in which individuals who are already tracked, traced, and tagged can be stripped of their political and social rights without any legal protection. Tropico is thus not simply a sly simulation about running a banana-republic type nation. Like its more serious counterparts in the Civilization serious, it is less about its manifest content than about the way that content is imagined for its players: perfect information and hidden algorithms, enabling the creation of a game-wide camp, of which the prison is simply a literalization of what is metaphorically true on the rest of the island. In my first post on Play the Past, I mentioned prisons as particularly evocative narrative spaces. Games like Prison Tycoon and Tropico rework the evocative space of the prison. In the case of Prison Tycoon, the rhetoric of the game focus so incessantly on the attributes of the prison itself that the prison becomes the entire world—unironically duplicating the subjective experience of the prisoners themselves, for whom the prison is a totalizing world. In the case of Tropico, we have moved even further along the spectrum toward the society of control. The island’s inhabitants are apparently free to go where they will and vote their conscious and rally against the president. But they are nonetheless mathematical variables, subject on one level to the game’s constantly calculating hidden algorithm and on another level subject to the president’s state of emergency edicts. In Prison Tycoon, the prison is the entire world. In Tropico, the entire world is a prison. Which game best reflects our recent past and current reality? Prison or camp? Discipline or control? The natural consequence of the rule of law or the Möbius-plane reversal of the rule of law into edicts and endless states of emergency? Agamben, Giorgio. Homo Sacer: Sovereign Power and Bare Life. Trans. Daniel Heller-Roazen. Stanford: Stanford UP, 1998. I love Tropico. It’s a fantastic game to show to people who have had little interaction with games, to help them understand the possibilities inherent in game-based simulations. 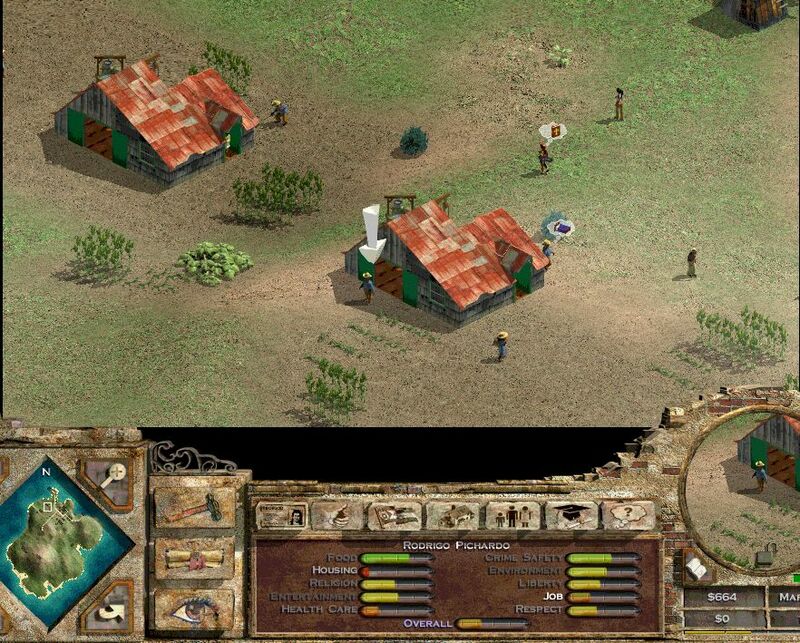 In fact, five years ago I wrote my Masters thesis about Game-based Approaches to Simulating Food Insecurity and Vulnerable Populations, and Tropico was the game that I used for example and explanations because it was easy for non-gamers to understand. Good stuff. Tropico 3 is a great update of the original and Tropico 4 is on schedule to be released this summer, I believe. Great Take on the Tropico series. Your description of how the “Hidden Algorithm” influences the overall theme of the game is an aspect that I think is often overlooked, possibly due to the more obvious social commentary dealing with international relations and attitudes toward third-world nations. While most people would probably consider the idea of a government tracking of our every thought and action to be monstrous, Tropico eases us into this scenario on the other side, slowly giving us more information and control over our people as we learn how to play the game. It’s only once we’ve learned how to play the game and mastered all the menus and commands that we can take a step back and see exactly how invasive our role in the game actually is. I think this post also does a good job of taking your ideas about control and reductionism in how we look at prisons and applies them to how we think about government. With online privacy and freedom of information being hot topics these days, the “prison simulation” metaphor is an interesting lens to critique public policy. Surely Tropico is a critique of the idea that if you have perfect information on every citizen, you can run the ‘perfect’ state. Omniscience does not guarantee success.